It’s Tuesday midnight, I’m sitting in my Fargo apartment – just hours after skiing at 11,000ft in Snowbird - remembering the whirlwind tour of the last 4 days, reflecting on the most powder snow that I have seen in decades, on the busiest skiing weekend in the US, on fabolous dinners in Salt Lake City, on a perfect trip with conditions that even locals referred to as “lucked out on this one” … but I’m getting ahead of myself. 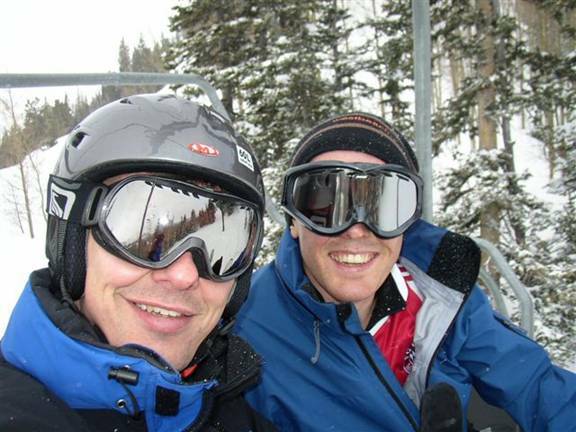 Earlier this year I had planned one more skiing trip to Utah prior to leaving Fargo for good. 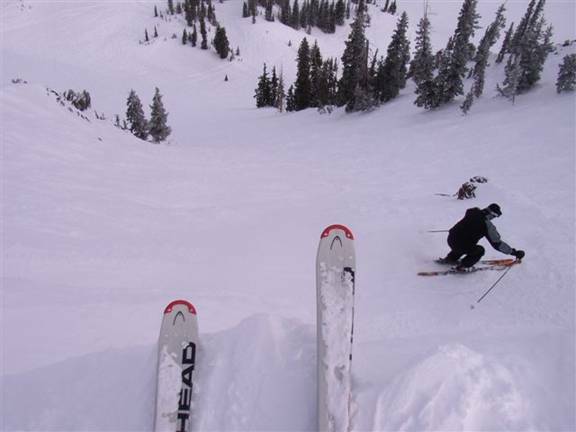 The connection Fargo – Denver – Salt Lake City is very convenient and allows you to fly in and ski the same day. 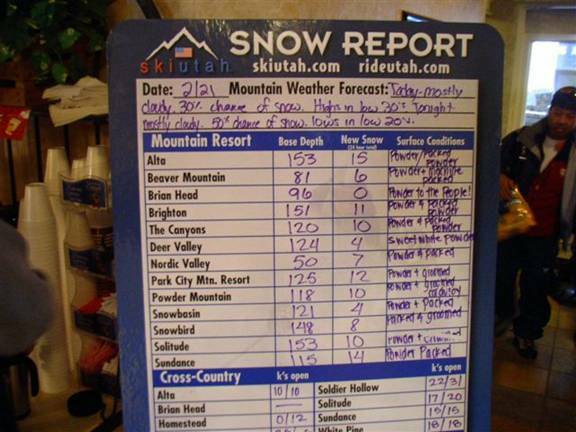 And after the trip last year I knew that Utah has some of the most reliable snow anywhere in the US – and this year was no different: Over the last 2 weeks it had snowed incessantly, and the Yahoo weather forecast showed snow on each one of the last 10 days. 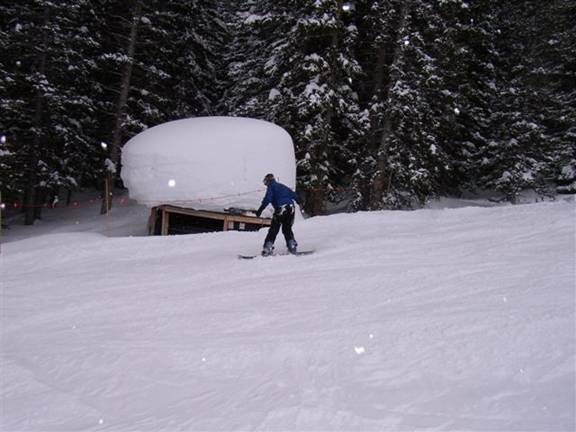 There would be 150” of snow at the base, and a few more inches practically everyday. get up really early to catch our plane. We take off in Fargo at 6:50am on time headed to Denver and after 1 hour layover continuing on to Salt Lake City, where we land around 10:00am local time. 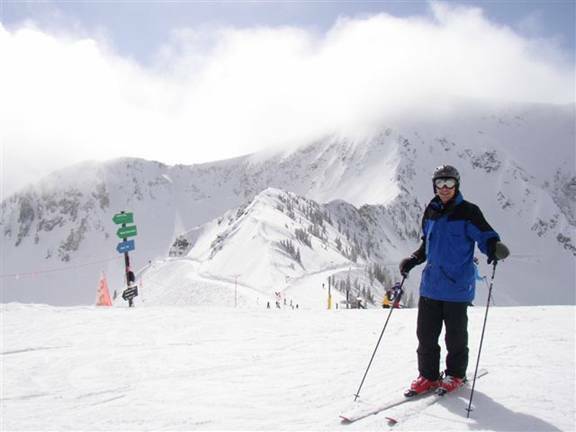 We get our rental car, swing by the skiing shop, pick up my skis and continue on to the Big Cottonwood Canyon and its Brighton ski resort. 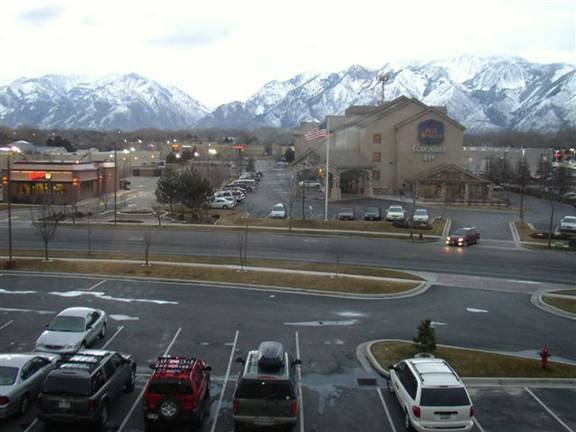 In Salt Lake City there is no snow, it is too mild down here; but as we drive up the canyon, the snow banks grow in size at every turn and before we get to the huge parking lot at the Brighton ski resort, the snow is up to 10 ft high so that you can hardly see beyond the side of the road. We get our day passes a little after 12:00pm noon, and don’t mind the weather which is on-&-off snowing with some breaks in the clouds. Chris has never seen really big mountains except for some snow-boarding he had done in New Zealand years ago. On the Brighton slopes he gets the hang of his board and a feel for the deep powder snow. Winter Wonderland! It appears that for the fairly flat slopes at Brighton there is actually a bit too much snow, so deep that it slows you down and you can hardly make it across some flat trails towards the bottom of the various lifts. Check the snow on the little platform by the side of the slope. 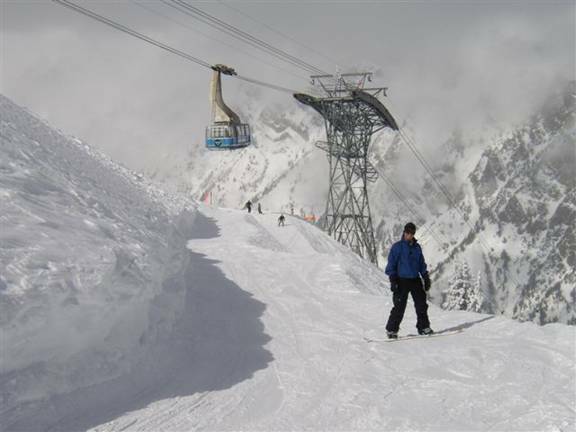 They have so much snow this year that in several spots they have to rope of the slope under the lifts as the skiers could almost reach up and touch the skis and boards of the people sitting in the lift chairs overhead – the regular height of the skilift minus the thickness of the snow layer does not leave enough safety margin! Soon it is 4:15pm and I literally catch the last chair at one lift which is closing at that time. We could go on and do some night skiing with our ski pass until 9:00pm – but after 4 hours in the deep snow we are pretty tired already and look forward to a shower and dinner. Plus who would want to knock themselves out completely on the first day when there are three more to come? On the drive out the canyon there is a break in the clouds and the sun comes out unexpectedly. 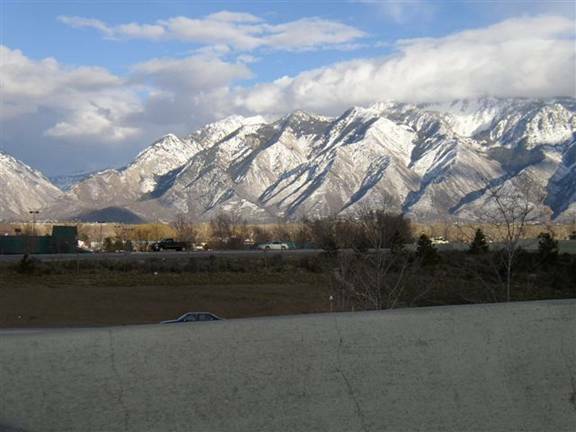 While we are zeroing in on our hotel address using the Hertz Neverlost GPS-based navigation system, we get a nice view of the mountains East of the Salt Lake City basin. We freshen up a bit at the hotel and drive downtown for dinner. All this almost feels like routine after the trip exactly one year ago. We park in the downtown area and go for a little walk while waiting for a table at Maccaroni Grill. The fresh air and mountain workout without lunch has made us quite hungry and so we feast as if there was no tomorrow. After two loafs of bread, salad, a seafood sampler appetizer and the main pasta dish we are stuffed. When the waiter asks whether we have any room left for desert, the words “Hell No!” slip from Chris’ mouth. We head back to the hotel and sit in the local hot tub to relax the muscles and soak up some heat. After a quick shower we fall into bed and hope we’ll be fresh again tomorrow! Today we are headed to the Snowbird resort. We are not the only ones. 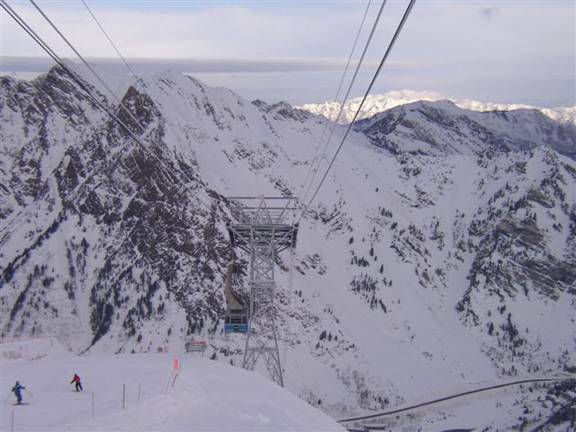 The road into the little Cottonwood canyon to the ski resorts of Snowbird and Alta is filled to its max capacity and the traffic is slow moving, which reminds me somewhat of the ski trips to French ski resorts. And in case you wondered: Yes, it was snowing heavily. 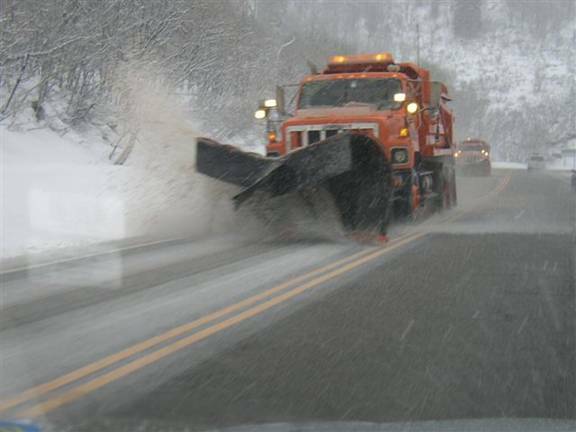 The snow plows were busy keeping the moderatly steep canyon road in decent driving condition. And boy, was there some fresh and fluffy snow on the slopes! Everywhere you turned there was deep, ungroomed snow. And it just kept coming down, not 1 hr or 2, no, it snowed heavily all day! 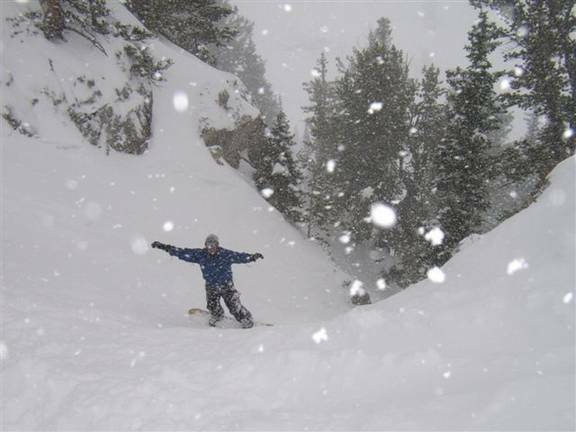 Snowboarding in Snowbird with powder snow. We didn’t mind the snowfall, as we just reveled in the fluffy and deep powder conditions which are so rare and precious. 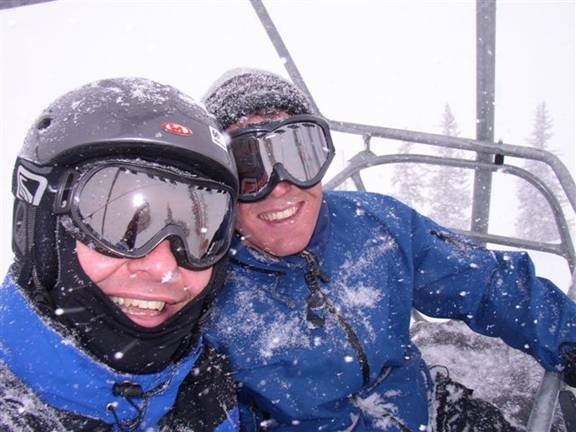 Even when we sat on one of the many quad lifts and the snow piled up while we rode up the lifts, that kept our spirits high. Chris had NEVER snowboarded powder snow. He was exuberant like a kid in the candy store. After every run had a new story to share, some new attempted trick and often spectacular, but harmless wipe-outs. In fact, we captured several movies with his Canon digital camera, which show the clouds of powder upon every turn. At one run we came down a long steep chute emptying out into a large bowl of super deep snow. It was exhilerating! The powder was so deep and fluffy that you could hardly see where you were going due to the “face shots” – bursting powder blasting up in your face. Unbelievable – moments of shear joy. At the bottom of that run I had to open my clothes and get rid of snow which had been blasted up from my boots under my jacket and into my bib and T-Shirt! 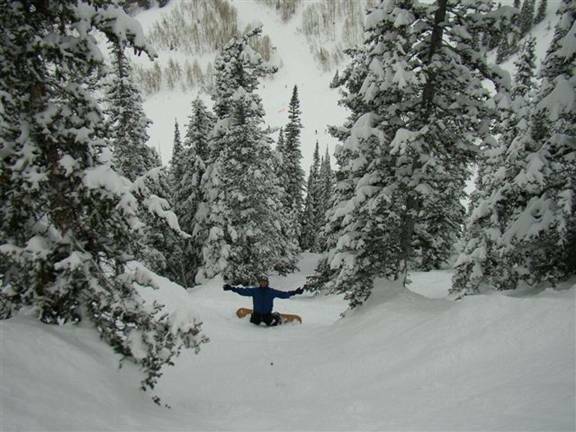 Several runs go through steep sections of forest and cliff areas where you would have to carefully pick your lines and definitely ski very controlled so as to not end up embracing a tree. The trees also gave the snow some contrast, which was important due to the mostly poor visibility of constant snowfall and cloud cover. At times you would hear other skiers nearby in the woods from their shouts of joy. Many yodels were heard on the slopes throughout the rest of the day wherever we turned. Whoever skied this day must have realized how special these conditions are. Of course we wouldn’t stop until the last lift stopped and we returned to the car around 4:30pm. In the few hours we had it parked it accumulated up to 4 inches of fresh snow. The drive back to the hotel was slow, and at one point in the lower parts of the canyon the rain had caused a washing machine sized boulder to fall and slide onto the road so all traffic had to carefully pass. The rain and grey landscape of the lower valley and city was quite a contrast to the blending white of the mountain. From our hotel room in Sandy South of Salt Lake City we could look back almost directly into the canyon. 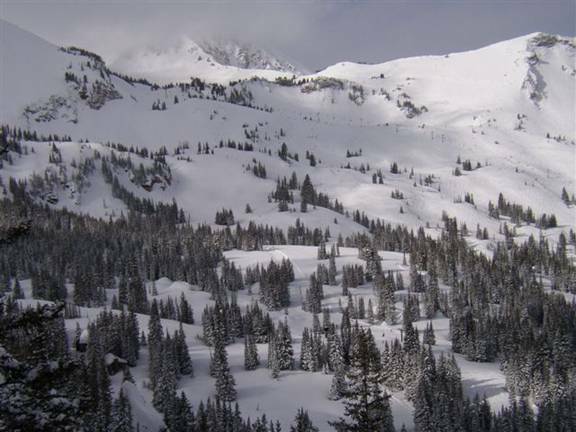 Notice the word “Powder” in every resort, and the first line showing Alta with 15” of new snow in the last 24 hours. That’s more than 1 ft (near ½ m)! Today I wanted to ski Alta. Since they don’t allow Snowboards in Alta we decided that Chris would stay in Snowbird while I would go on to drive a few miles further up the canyon and ski in the nearby resort of Alta. And indeed, on the first rides up the lifts the sun was breaking through the clouds and revealed the massive amounts of snow dumped everywhere. 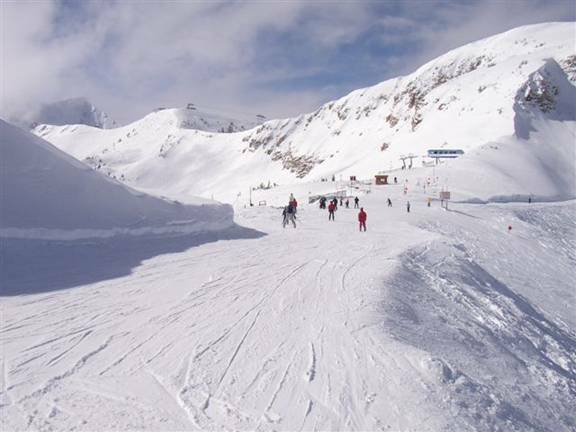 Compared to the day before, it was great to actually see where you were going and so one could ride through the forming moguls more aggressively and with better style. I now turned on my iPod. On the way up the lift I just relaxed, my eyes closed and feeling the warmth of the sun in my face – sunscreen SPF 30 and lip stick were applied repeatedly. Winter Wonderland. On the top of the hill I would start the right groove for the next run and then pounded down through the trees and the deep, at some spots still untouched powder. With the altitude of up to 10,500 ft I was panting heavily, skiing steep moguls in such conditions is like sprinting: You go all out until your legs burn, heart races and your lungs burst. 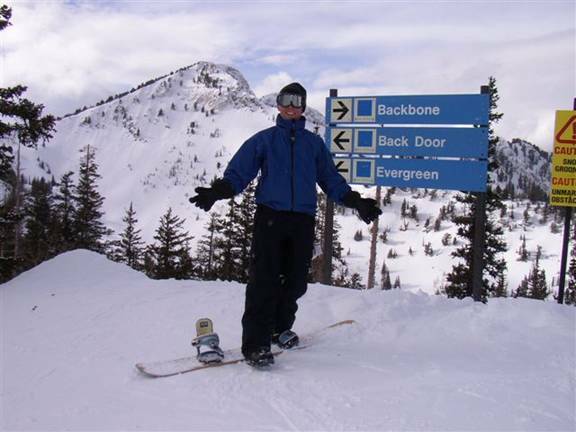 Often I would arrive at the bottom of the hill, get in line at the lift and realize how heavy I was breathing. After 3 hours of such relentless exercise I was actually releaved when the wait time at the Sugarloaf quad lift would grow to about 20 mins per ride. I called Chris and left a message on his voice mail. Apparently they have installed antennas to relay cell phone signals into the canyon. I had never noticed people on the phones while skiing, but here phone calls on the lifts and slopes were ubiquitous. 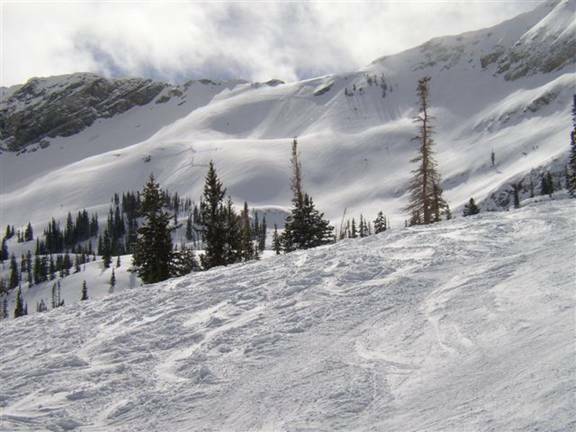 Initially I thought about meeting at a point where the two ski resorts touch: The following photo is taken after exiting the (Alta) Sugarloaf lift, looking towards the Baldy Express lift (Snowbird) and with the Snowbird Tram topping out in the left background. Another interesting observation were the frequent explosives set off by the ski patrol as part of their avalanche control program. At times I could see the flash of another explosive going off, followed by a massive boom several seconds later. These blasts would trigger controlled avalanches in critical sections so that those areas could later be opened up for general skiing. And of course, with today President’s Day being the busiest skiing day of the season, there were thousands of people on the slopes. 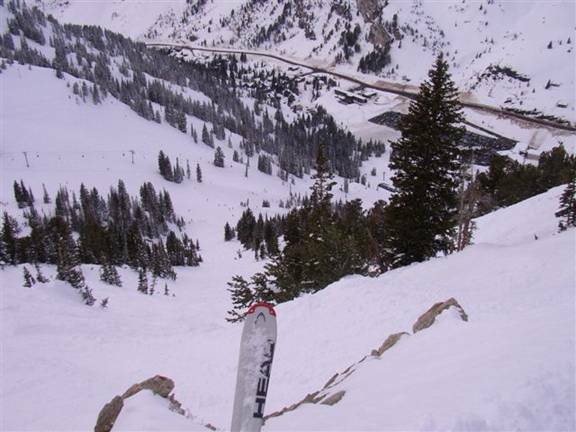 There wasn’t a line through some steep cliff or tree line too crazy as to not be skied by some local expert skiers. 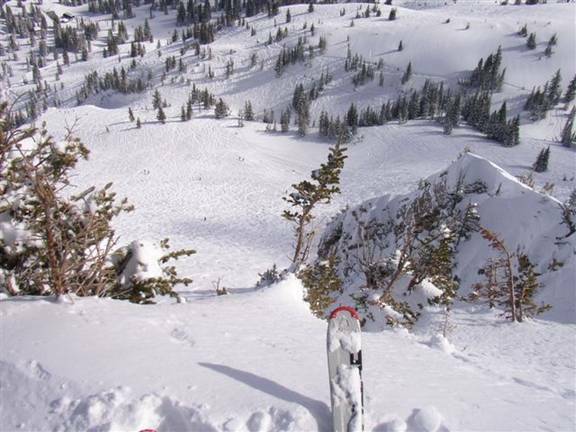 I was stunned in the morning when I saw no less than a hundred skiers single-filing across a just opened traverse to get their shot at a slope with yet untouched powder. Needless to say that 1-2 hrs later there was hardly any more untouched spot on the mountain. Except for one section called the ‘Castle’ under the Sugarloaf mountain. It was being prepared through setting off avalanches all day by the ski patrol. One could see the strenuous path they had cut through the deep snow to get access to this side of the mountain. Even if they opened this up, anyone who wanted to get to the ‘Castle’ would have to hike up perhaps 200ft through deep snow and then proceed along a long, flat traverse under some cliff face. And to my surprise, some skiers actually got in line next to the top of the lift, apparently waiting for the ski patrol to open this face of the moutain. I did three more runs on this lift and saw the queue getting longer and longer! 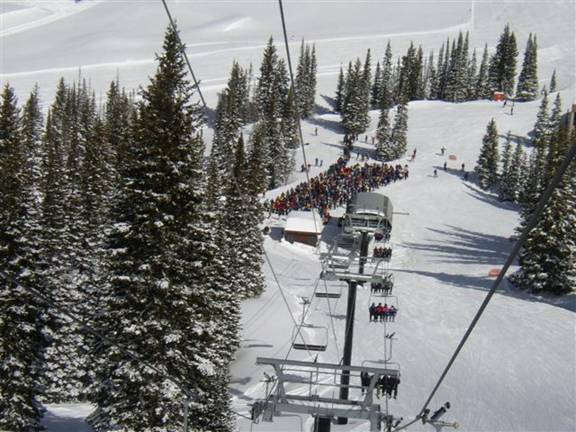 A long line at the top of a ski-lift – that I have not seen before. 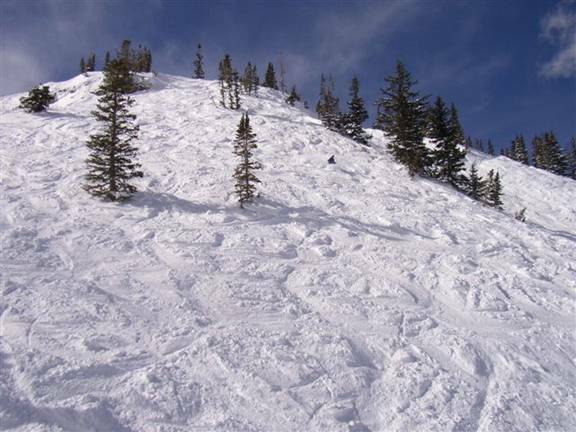 Eventually they would open this up fairly late in the afternoon and the by now several hundred people would patiently march in a long line to get their one shot at a long run of untouched powder. 1 hr later the entire flank – still untouched in the above photo - was criss-crossed with hundreds of tracks - amazing! It was getting late in the afternoon, and I was getting really tired. Shortly before 4:00pm I turned to the last descent of the day down to Alta. 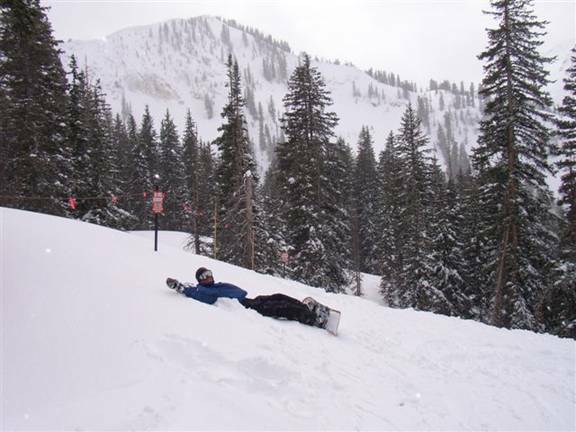 The moguls were not fun anymore, I was just too tired. But the views were still impressive. 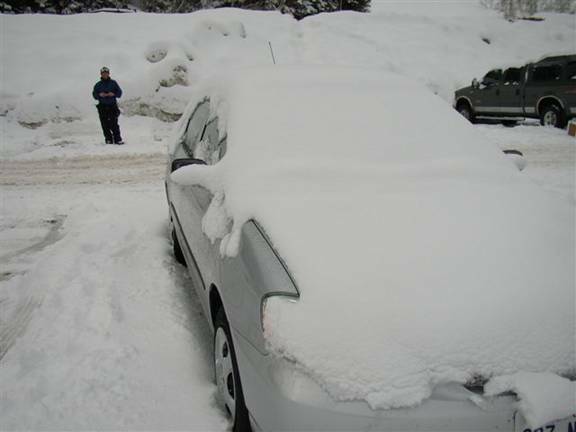 After I got to the car and changed out of the ski cloths the phone rang. Chris called to coordinate when and where I would pick him up on the way back. It took a while to get there as a few hundred, well perhaps a few thousand, cars all tried to get out of the canyon. But Chris and I were too busy and excited sharing stories about where we had skied, just how perfect the conditions had been all day and who we had met on the lifts or skied with. Before we knew we were back at the hotel and doing the daily hot tub, shower, check email, and get ready for dinner routine. This night we went to Baci’s, an Italian restaurant which claims to be the gold standard for Italian dining in Salt Lake City. 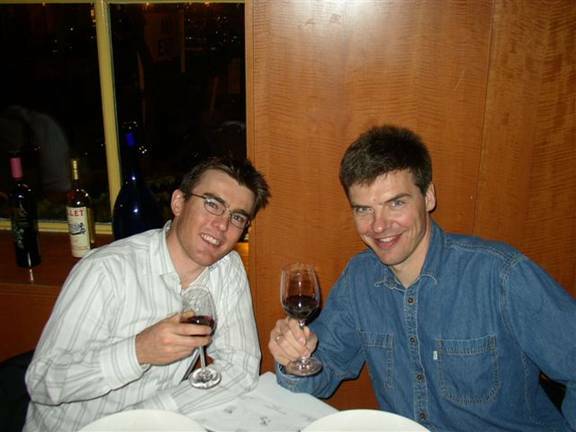 We enjoyed fine food and a flight of wine followed by some fabolous desert which will long be remembered. 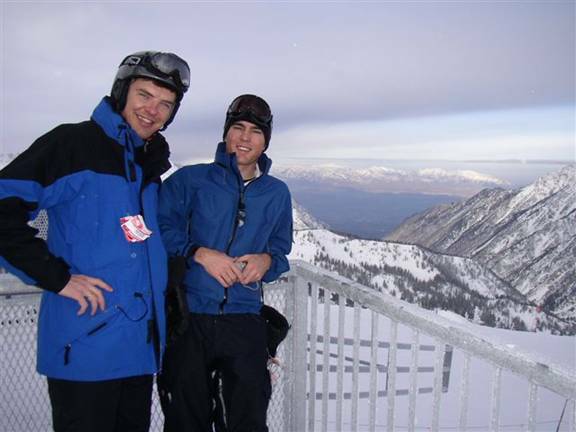 We were just happy that everything had worked out so well and the skiing conditions had been perfect. What else can you ask for? We get up early and pack our bags to check out of the hotel. We decide to go to Snowbird once again, as it is just much better than Solitude. At 9:00am we stand at 11,000 ft on top of the Snowbird Tram ready for another 5 hours of skiing. The weather is about to switch back to more snowfall, but for now we still have a few hours of mixed sun & clouds and good visibility. We come back to the long slope we had skied on Sunday which offers a pretty breath-taking view from the top. Another skier just dropped in to my left a split-second before I pushed the button for this next photo. Chris also shot a short movie of me going down this same couloir minutes later. On and off we had sun and cloud cover. In the sunny breaks we would have great views of the surrounding mountains. There were so many different slopes to be explored that I felt at times like a sight-seeing tourist exploring a city and looking at a map asking the question ‘Where to go next?’. Since Chris had been snowboarding here all day yesterday with good visibility I gladly followed his lead down various routes. We would alternate taking movies or just capturing the exciting scenery with our photo cameras. Of course every good time comes to an end at some point, and so it was for our skiing trip at around 2:00pm. 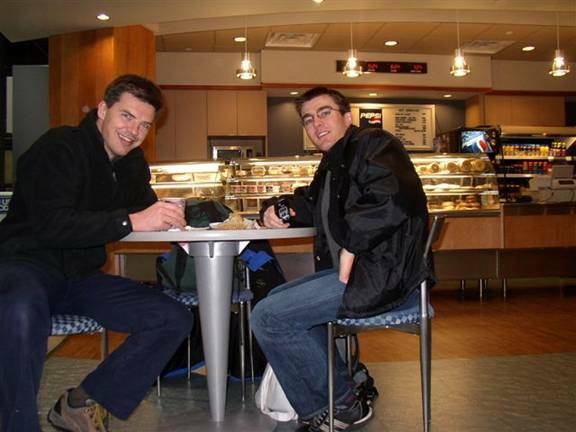 We went down to the parking lot, drove out to the city, returned my rented ski gear, packed our bags and suitcase, returned the rental car and checked in for the flight home. 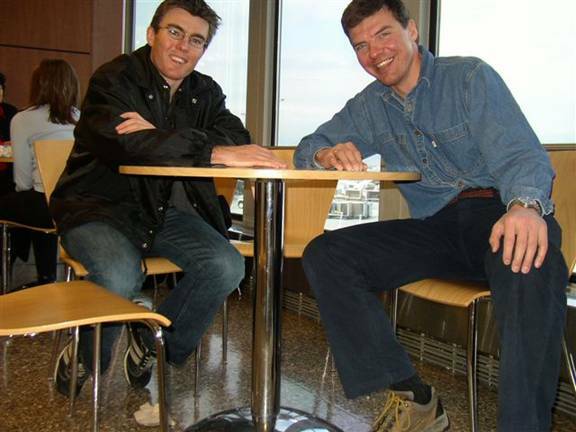 Everything worked out as planned, and I even got to take a self-timed picture at the same spot in the Salt Lake City airport like last year on the return trip with Matt Keller.